A black and white portrait photograph of Charles King. This picture is from a frame of portraits of members of Composite Lodge No. 30, AF & AM. Charles King (1837-1915) married Henrietta Kohn in Chicago in 1866. They had nine children. 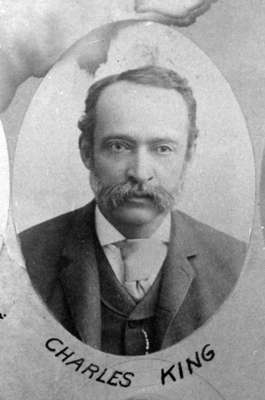 Charles was very active in Whitby and Ontario County politics, entering the town council as alderman for the Centre Ward in 1872, attaining the position of deputy-reeve and reeve, and serving as the Warden for the County of Ontario in 1897. He also served for many years on the local Board of Education, and in his later years, on the Whitby Board of Trade. In 1906, upon retirement from the King Bros. Tannery, he settled in Toronto. Bottom of photograph reads: "CHARLES KING"